Each session lasts 6 days and accommodates approximately 126 campers with a camper to staff ratio of 2:1. The fully equipped medical facility is staffed 24 hours a day by onsite doctors and nurses. Our medical facility allows us to provide a physically safe camp experience for all children. In the beginning of June, we host Camp Inspiration a week long family program for children (ages 5-21 years old) who are BIPAP or ventilator dependent. Camp Inspiration allows campers to participate in typical summer camp activities including swimming, High Ropes, Arts and Crafts, a horse drawn carriage ride and the chance to participate in a camp dance, talent show and campfire. Be a camper! Learn more about eligibility. 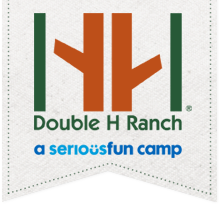 Double H Ranch programs are designed to provide camp experiences that are memorable, exciting, fun, empowering, physically safe and medically sound. Our program staff and counselors work to ensure all activities and events are inclusive for all children. Hear about the magic of camp from our campers and their families! The magic of camp starts here! Enroll your child for a carefree summer camp experience in the Adirondacks – where kids just get to be kids. Join our summer staff team and make a difference in the lives of children dealing with life threatening illnesses. Our pursuit of the greatest, safest camper experience will always include recruitment of caring and qualified volunteers. Whether you have a day, weekend, week or an entire summer, our camp offers a range of volunteer opportunities for you to make a difference by giving your time and talent.